A unique opportunity to restore a substantial Grade II Listed country house set within approximately 28.9 acres, with a range of outbuildings. For sale as a whole or in two lots.Rumleigh House is a substantial Grade II Listed property with a significant historical past, and has been in the same family ownership since 1929. Owned by the de Rumleghe family during the 14th century, the house originated as farmworkers' cottages, and additions were added over time as the house became the home of the Squire. The newest part of the house is thought to have been built around 1890. The gardens at Rumleigh House are extensive, and the land used to be known as ‘Rumleigh Fruit and Flower Farm'. It was the leading market garden in the area and a great attraction. It can still be seen where the sites of the old wooden greenhouses were situated. The property has been used as three apartments and a separate cottage and is in need of renovation. 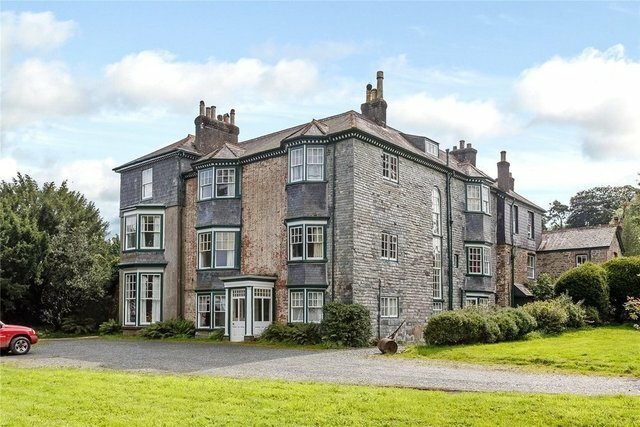 It provides fantastic potential for refurbishment and, subject to the purchaser pursuing relevant planning consents, could be converted back to its origins as a grand country house surrounded by its own grounds. The original period features have been retained throughout the property, including the grand 18th century staircase furnished with panelling, turned balusters and column newel posts. On the ground floor there are extensive store rooms which, in the past, housed the old kitchen and workroom, still with the original chimneypieces, as well as a workshop. The ground floor comprises two bedrooms, two reception rooms, a kitchen and a family bathroom. A door leads out into the Rose Garden behind the property. The first floor is accessed via a staircase to the rear of the property, as well as via the main staircase. A corridor leads to the main part of the house, as well as a further double bedroom with a fireplace and basin. The door into the first floor opens into a ‘passage room' with beautiful large, shuttered sash windows looking out onto the gardens. There is a double aspect kitchen with lovely views of the Calstock viaduct in the distance, as well as a utility room, family bathroom, spacious sitting room, an enclosed Veranda, separate WC, drawing room and two large double bedrooms; both with built in storage and attractive fireplaces. Beautiful views can be enjoyed from many of these rooms, which look out over Kit Hill Country Park, Cotehele House and the viaduct in the distance. The second floor comprises two reception rooms, three bedrooms, a kitchen and a family bathroom. It is accessed via an outside staircase, as well as both the front and rear internal staircases. More fabulous views of the viaduct and the countryside in the distance can be enjoyed from the front-aspect rooms. An entrance from the ground floor store rooms leads into the South Wing Cottage. The ‘cottage' also has its own entrance leading out to the gardens. A staircase from the kitchen leads upstairs to the first floor, where there are two bedrooms, a family bathroom, WC and two reception rooms. Rumleigh House is surrounded by beautiful gardens and grounds including a walled garden, rose garden, an orchard with ancient apple trees, a level lawn area which was formerly a tennis court and a woodland area.The majority of the land at Rumleigh House slopes gently away from the house towards the banks of the River Tamar, where there is direct water access via a steep wooded bank. There are four fields; the West Field, East Field, Far West Field and Upper Far West Field. Within the grounds of Rumleigh House there are a variety of outbuildings, many of which are currently let to the neighbouring farmer. The tracks at Rumleigh House circumvent the main property, meaning the farmer does not have to directly pass the house in order to access the outbuildings or the land; preserving the privacy of Rumleigh House. 1. A quadruple garage to the side of the property. 3. A large workshop, with electricity connected. The outbuildings are not included within the Grade II Listing of Rumleigh House and offer enormous potential for a range of equestrian, livestock, tourism or business uses, subject to obtaining the necessary planning consents.